The town at the Open Air Museum offers a wide range of experiences for the family. Photo: Ian Brodie. The Town at the Open Air Museum in Lillehammer is designed to look like an inland town in the early part of the 1900s. In summer there is plenty of life and activities, and a wide range of experiences for the whole family. Lillehammer, founded in 1827, is the starting point for the town at the museum. Lillehammer got a railway connection and electricity in 1894. Many of the houses have been moved here from the centre of Lillehammer. The town blocks were made up in the main from panelled wooden houses. The general design of buildings in the villages was transferred to the town. Along Storgata (the High Street) there are clusters of buildings housing shops, workshops, flats and intimate back yards. Streets, houses and fittings are designed using examples from the early 1900s. The environments give an insight into the lives and living conditions of people from different parts of society. The pharmacy with the apothecary family’s flat shows how the town’s middle classes lived around the turn of the 20th century. On special occasions you can see pill making demonstrated at the pharmacy. In the Olsengården you will meet a 1930s housewife doing her housework, or going into the back yard to feed the rabbits and hens. Mrs. Olsen likes to talk about the old days - an experience in itself. There is something for the whole family to be found in the historical shops. Be tempted by the smell of fresh coffee, sweets, old fashioned toys, and nostalgic cups, bowls and plates. Around the market you will find the post office, the railway station with train, the bakery and the Narvesen kiosk. During the high season this part of the Open Air Museum offers a wide range of experiences for families. Several of the wandering theatres start here, and in the back yard of the Olsengården you can practice walking on stilts, horseshoe throwing or have fun with the rabbits. Buy something nice to eat while you watch the life of the High Street. The large steam locomotive standing at the railway station is also worth a visit. Olsengården houses a family during the summer who portray the time between the two great wars through the large and small duties of the day. The smells are a mixture of gravy, sunlight soap and coffee. The daily duties are varied, and it is always an experience to visit and listen to the daily challenges and pleasures of a craftsman's wife in 1938. In the back yard there are hens, rabbits and a small kitchen garden. Here the family can have some fun horseshoe throwing, walking on stilts and feeding the rabbits. While a show song from Chat Noir spins on the gramophone the wife tells us all about her troubles. You might also get some gossip about the woman next door. You get to hear lots as they are one of the few families who have a telephone installed. The mirror in the window is also very useful. Olsengården was originally located in Storgata 121 in the northern part of Lillehammer. Three generations of craftsmen have lived and worked here. The farrier and smith Oluf Olsen purchased the building in 1890 and the son continued to run the smithy. His grandson became a mechanic and repairer and the people of Lillehammer came to Olsengården to have their bikes repaired. Later the building and yard had to give way to new buildings and were moved to Maihaugen. Olsengården is the only complete town block with yard at Maihaugen. All the buildings originate from the same property and have been re-erected in the way they were, relative to each other. Olsengården is always open during the summer. Mrs. Bye makes coffee at Olsengården. The story of the time between the two wars is told here. Photo: Jørgen Skaug. The Olsen family at the dinner table. Photo: Mark Purnell. Washing clothes at Olsengården. Here you can take part in the town’s everyday life of games and duties. Photo: Esben Haakenstad. Father and children throwing horseshoes in the back yard at Olsengården. Photo: Mark Purnell. We have furnished one of the shops at the museum at Maihaugen with fittings from the early part of the 1900s. During the high season the shop is open and you can find kitchen equipment, writing materials, old-fashioned toys and lots of other things. 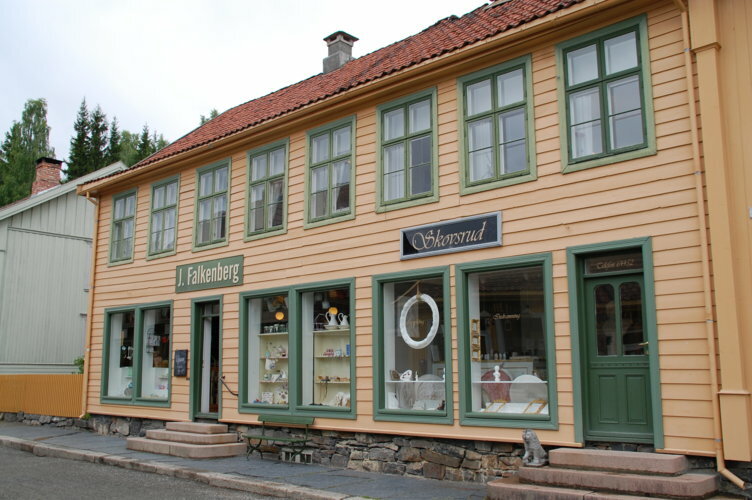 The fittings of this shop came from the original Falkenberg shop located in Jernbanegata in Lillehammer. Johan Falkenberg took over a tannery at Vingnes in Lillehammer in 1902. At the same time he opened a shop close to the railway station. Hides, skins, harnesses and shoemaker articles were traded here. The shop was trading until 1987. 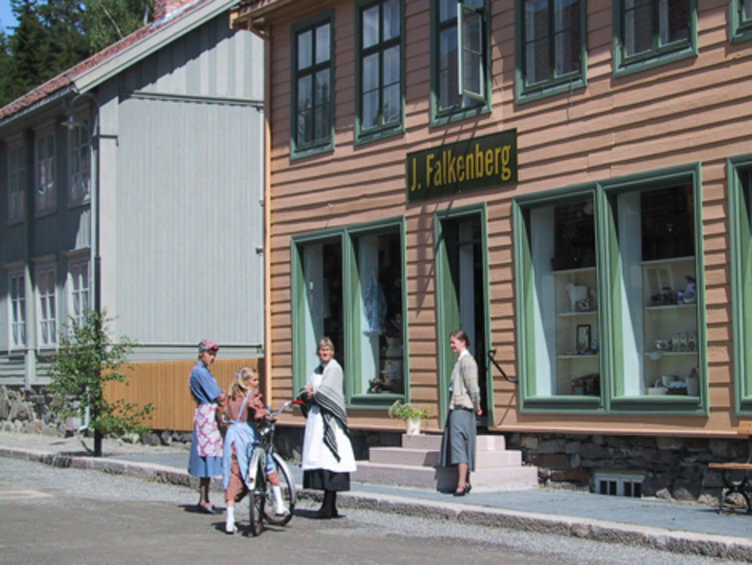 The Falkenberg shop was originally located in Jernbanegata in Lillehammer. The shop was trading from 1902 to 1987. You can find special gifts in the historical Falkenberg shop. Photo: Kåre Hosar/Maihaugen. Life in the street outside Falkenberg. Photo: Maihaugen. 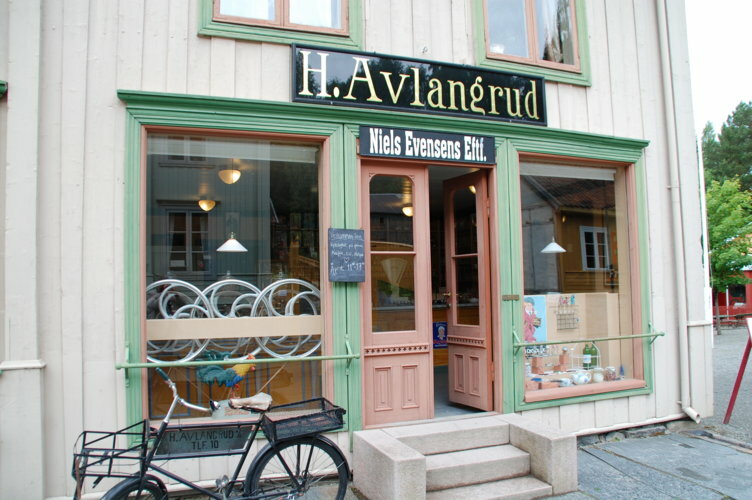 H. Avlangrud grocers shop was originally located at Storgata 78 at Lillehammer. The shop specialised in “select groceries” and obtained most of the available exotic groceries for customers from near or far. 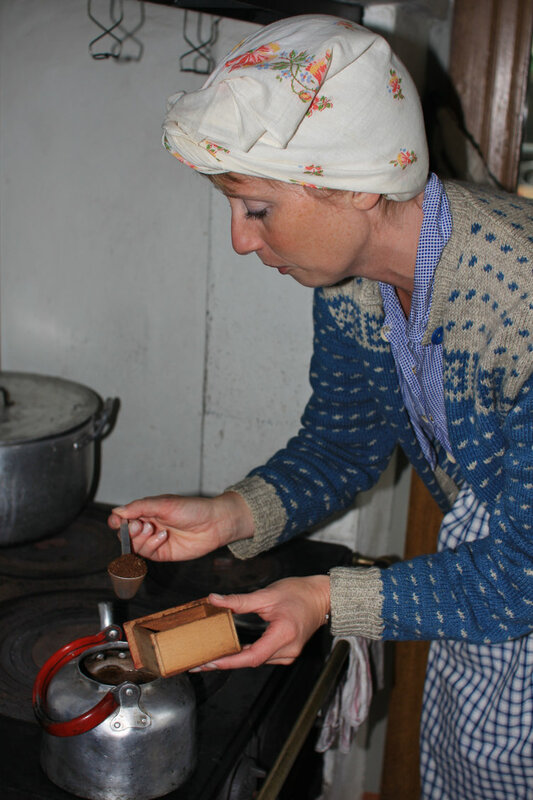 Coffee was one of the specialities and this tradition has been carried on in the museum shop at Maihaugen. We offer a selection inspired by what was sold during the period 1930-1950 at Avlangrud. You are able to purchase Norwegian specialities. The shop was established as early as 1854 by Niels Evensen. Hans Thv. Avlangrud purchased the residential development including the shop during the summer of 1912. His children and grandchildren continued to run the shop. The doors were finally closed for the last time in 1994 after 140 years. 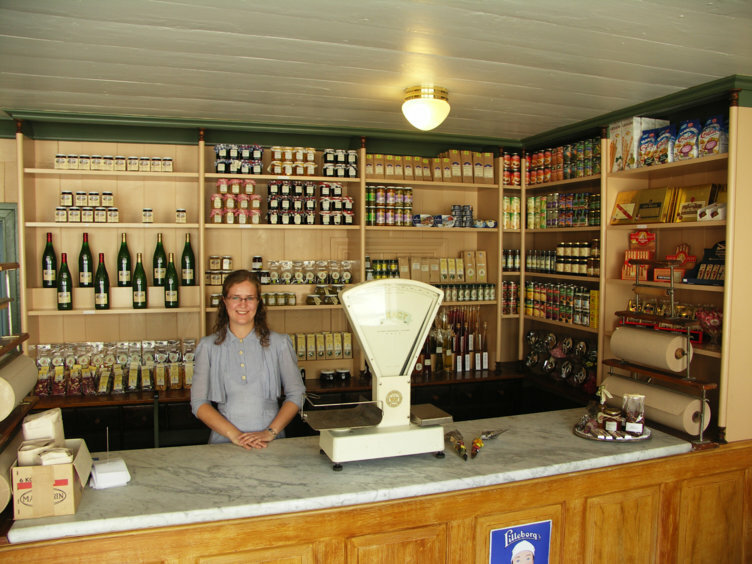 Maihaugen took over the old shop fittings from the last owner in order to create a grocer’s shop at the museum. The entrance of the historical Avlangrud shop in the Town at Maihaugen Photo: Kåre Hosar/Maihaugen. Restoration of H. Avlangrud grocer’s shop was given by the Friends of Maihaugen in connection with the 100 year jubilee in 2004. Photo: Maihaugen. 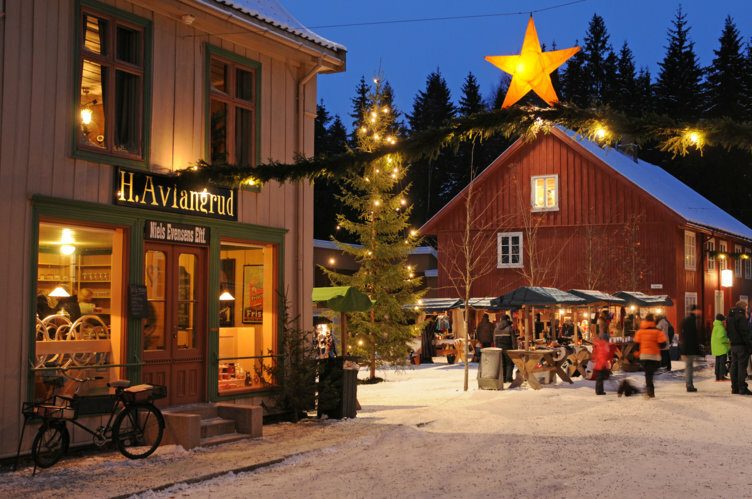 Christmas atmosphere at Avlangrud and the rest of the Town during the Christmas Market at Maihaugen. Photo: Esben Haakenstad. 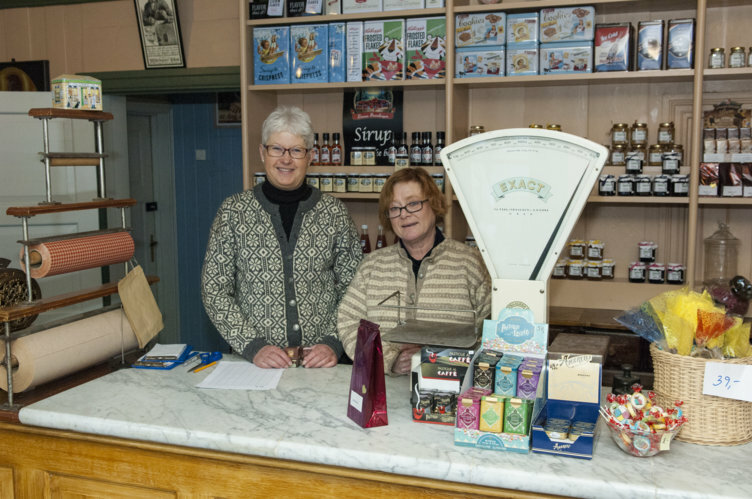 Lots of nice things to buy from these smiling ladies at the Avlangrud shop. Photo: Audbjørn Rønning/Maihaugen.